SRINAGAR, India (AP) — At least one person was killed and about two dozen others wounded on Saturday as protests against Indian rule followed by clashes erupted in Indian-controlled Kashmir shortly after Eid prayers, police and residents said. Meanwhile, the Indian military said a soldier was killed early Saturday after its patrol came under fire from Pakistani soldiers along the highly militarized Line of Control that divides disputed Kashmir between India and Pakistan. 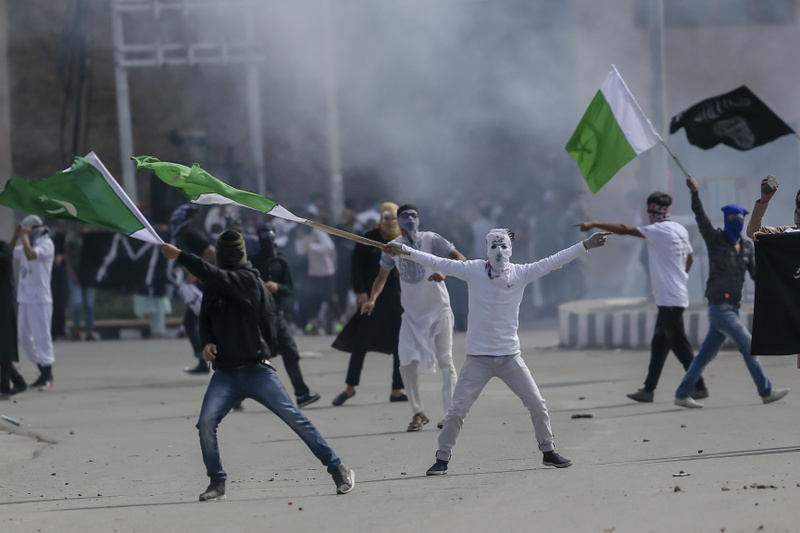 Shouting "Go India, go back" and "We want freedom," hundreds of people began marching in the southern Anantnag area but were confronted by government forces firing tear gas, leading to clashes with stone-throwing protesters. The use of force intensified as the protesters barraged police and paramilitary soldiers with a hail of stones while the troops fired shotgun pellets, injuring at least 17 people. One young man among the injured died at a hospital. He suffered pellet injuries in his head and throat while at least nine other men among the injured were hit by pellets in their eyes, medics said. However, police said in a statement that a "preliminary investigation" revealed that the young man died when a hand grenade exploded in his hand, a claim refuted by local residents. Protests and clashes also were reported at several places across Kashmir, including the main city of Srinagar, after Eid prayers concluded. At least seven protesters also were injured in southern Shopian area. Muslim Kashmiris on Saturday were celebrating the Eid al-Fitr holiday to mark the end of the holy month of Ramadan and its daytime fasting. The Indian military said one soldier was killed after Pakistani soldiers fired mortars and guns and called it an "unprovoked" violation of the 2003 cease-fire agreement between the rivals. Pakistan did not immediately comment. In the past, each country has accused the other of initiating border skirmishes and violating the cease-fire agreement. Anti-India sentiment runs deep in Kashmir, a disputed Himalayan territory divided between nuclear-armed rivals India and Pakistan but claimed by both in its entirety. In recent years, the Indian-controlled portion has seen renewed rebel attacks and repeated public protests against Indian rule. Rebels have been fighting Indian control since 1989, demanding that the territory be united either under Pakistani rule or as an independent country. Most Kashmiris support the rebels' cause while also participating in civilian street protests against Indian control. Nearly 70,000 people have been killed in the uprising and the ensuing Indian military crackdown.